I guess the adage if you build it, they will come, is true, or at the very least when building insect hotels, the saying suggests some level of accuracy. 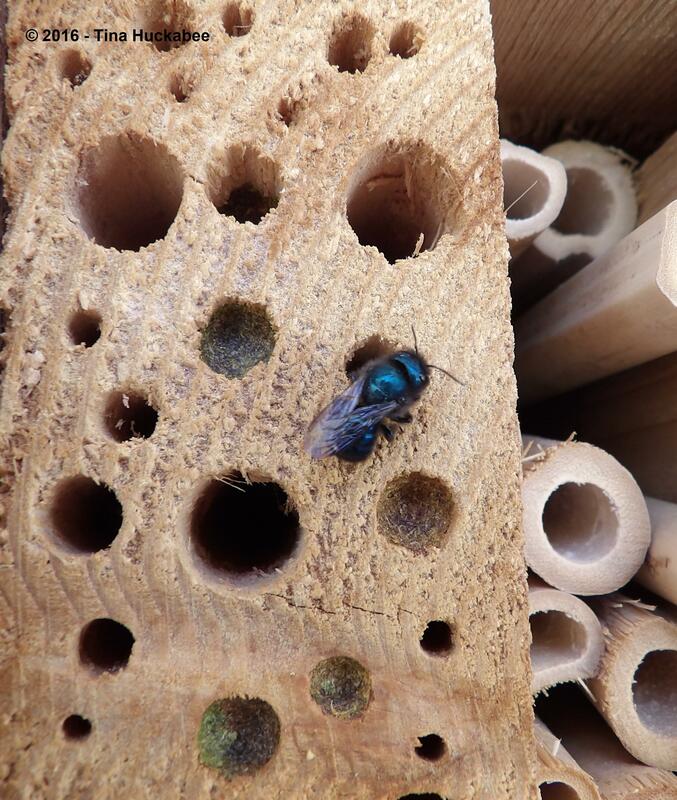 For February’s Wildlife Wednesday, I wrote about our building and placing of two insect/bee hotels in the garden. While building these things isn’t necessary to provide homes and nesting spots for bees and other insects, they are fun, quirky additions to a garden and they lend some architectural gravitas to a wildlife habitat. So far, the houses/hotels have been a big hit with some of the native bees! 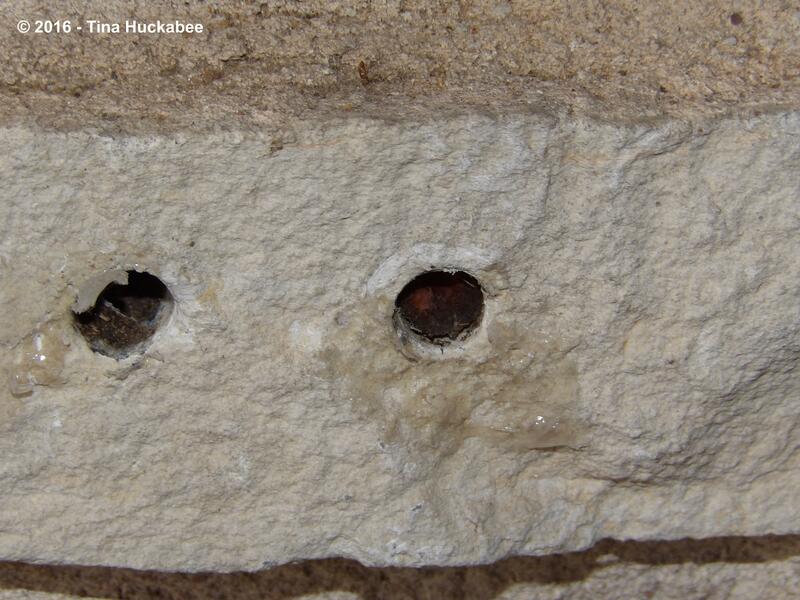 Some of the bee holes are filled providing protection and nourishment for the larvae. Wayward Osmia ribifloris rescued from my kitchen. I should add that the identification of this bee species is subject to update–if you recognize this beauty and I didn’t identify the bee correctly–please let me know. 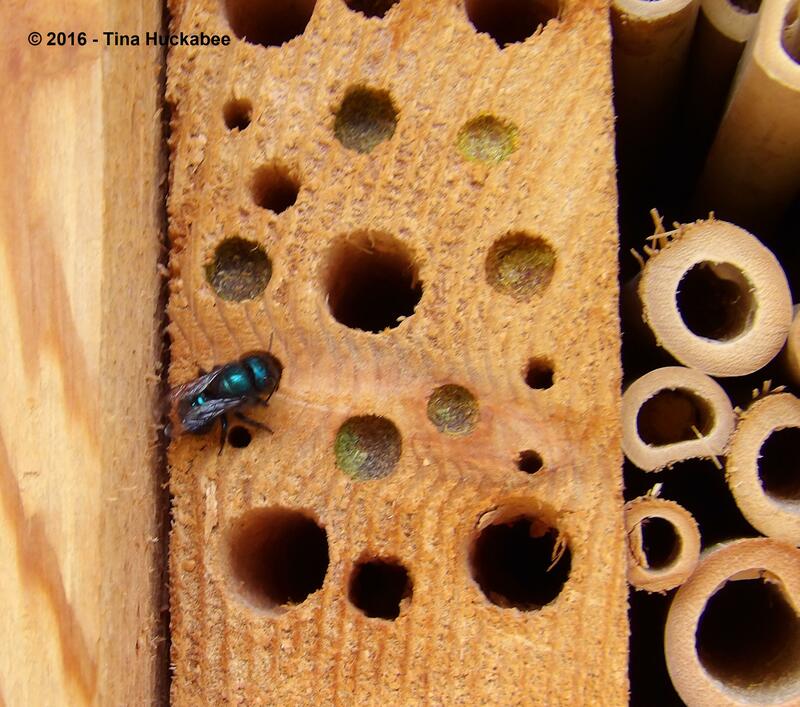 The O. ribifloris O. lignaria is a mason bee and judging from the holes in masonry of my back patio, I see why this species is categorized thus! Osmia ribifloris searching for just the right hole for her nest. 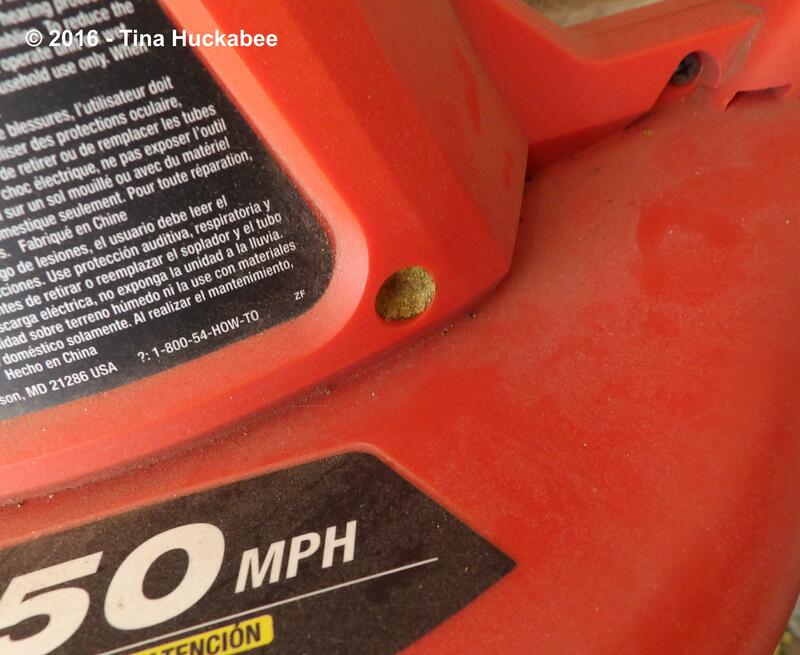 Additionally, these bees also build their nests in the screw holes of my two electric leaf blowers and an electric trimmer that I failed to store in the garage prior to the bees deciding that it’s time to raise up their families. Osmia ribifloris searching for another nesting site. 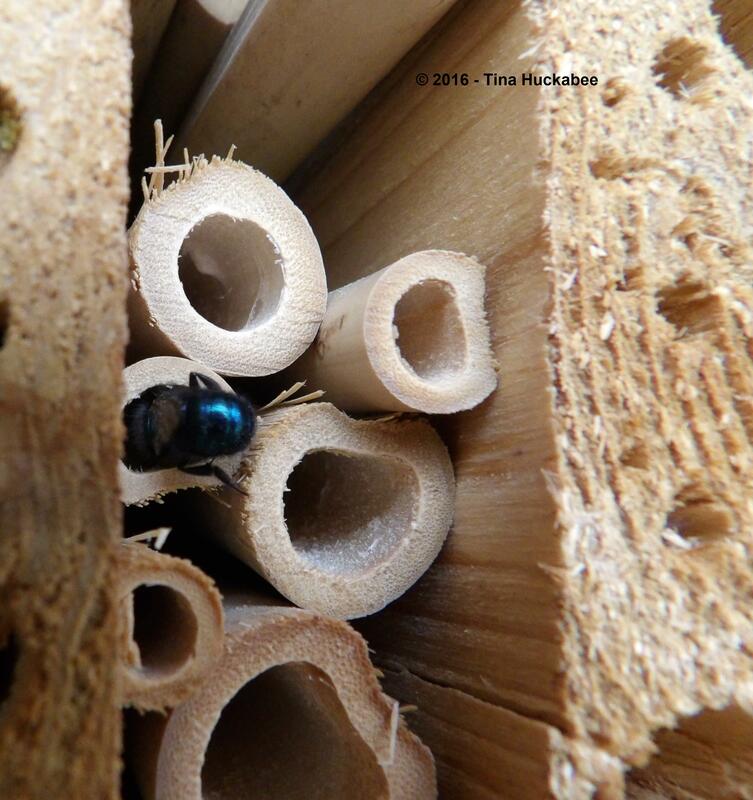 That’s what I mean when I suggest that insect hotels aren’t required–bees are quite opportunistic and imaginative when finding cozy spots for their progeny. 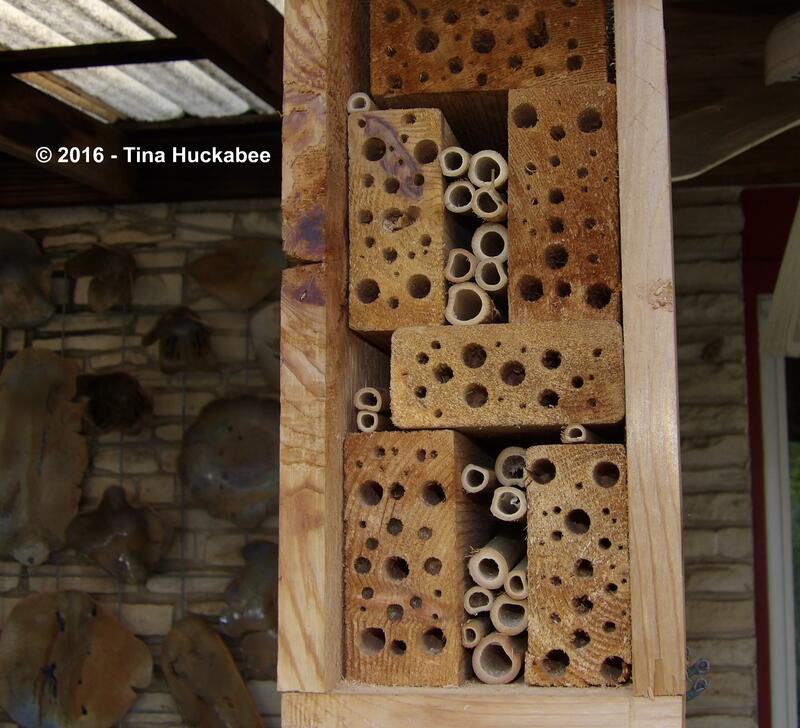 Regardless, the bee hotels are charming and I’m tickled that the bees are using them for their nesting/nursery bed-n-breakfast hotels. Several O. ribifloris have busily laid eggs and safely tucked in those eggs and future larvae. Fascinating to observe, it takes an individual bee a couple of hours to pack the hole with pollen and soil. In my attempts to photograph the bee action, I stood for periods of time, camera at the ready, watching one, or more, bees at work. Each bee flies into her chosen hole and disappears for upwards of 5 or 6 minutes. Then each zooms out and off again, disappearing for 5-10 minutes while foraging for more nest-building stuff before returning to the hole. The process repeats until the holes are filled almost to the rim. 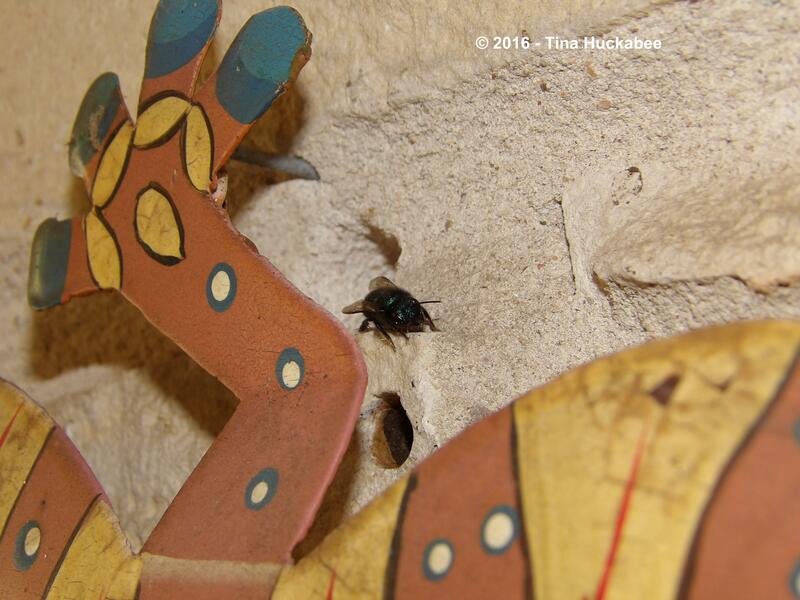 As the hole fills up with packing material, the bee is visible at the mouth of the hole, working and wiggling her bee magic so the bee babies are well-nurtured as they develop. 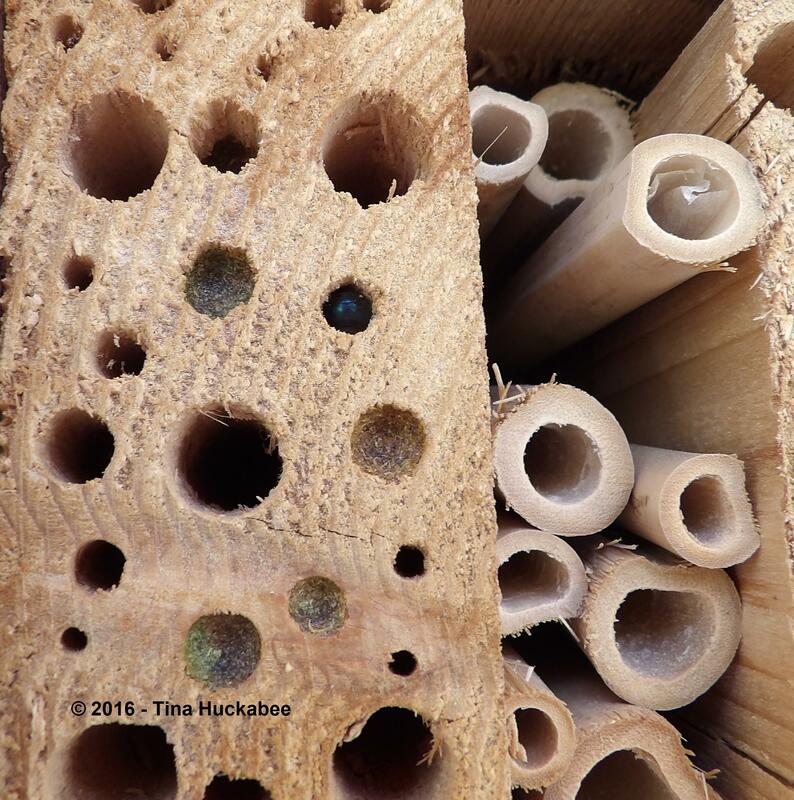 What native bees use as “packing material” varies, but it usually includes pollen (often from specific plants), soil/mud, and sometimes leaf material. Ever had perfect little holes taken out of rose leaves? 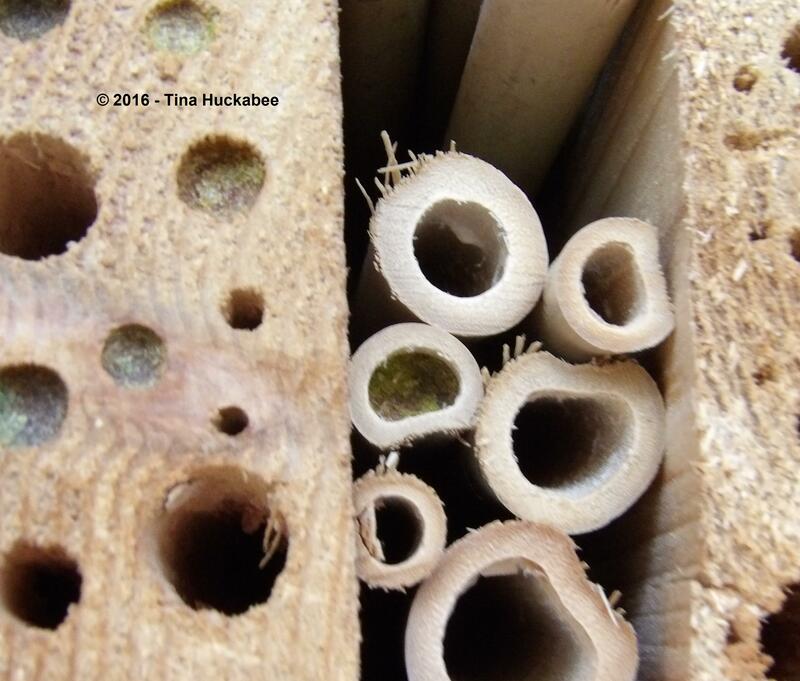 There’s no doubt that was the work of some leafcutter bee variety as she was building her nest. 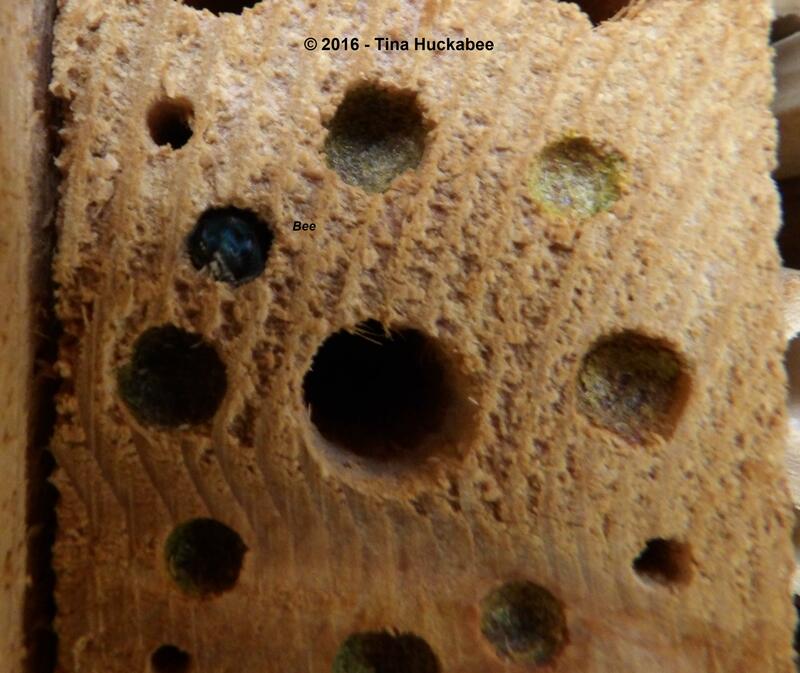 Not only have the O. ribifloris bees filled the drilled holes, but they’ve utilize the cut bamboo pieces for their nests. The bamboo hole was filled in one afternoon by the industrious bee. Since taking these photos, other holes have been filled, but really, how many pollen filled-hole photos do you want to see? My original plan for the insect hotel was to stack them, one on top of the other in a shady corner of my garden. …and affixed the larger of the two on the fence. Because the fence-placed bee house wasn’t getting any bee action, and was difficult to get close-up photos of without tromping all over plants and soil, and was soaked during heavy rain, I’ve recently moved it closer to the back patio and in a more protected area. This is also a spot where I can more easily observe the comings and goings of bees without crushing emerging, or emerged, plants–or tripping over rocks. So far, for whatever unknown reason, I still haven’t seen any bees nesting in that house. Oddly enough and for now, these O. ribifloris are the only species choosing to nest in the insect hotels, but I don’t think I’ve seen them working any of the many blooms that are currently available in the garden. Perhaps I’m not out in bee-watching mode at the time they’re working flowers, but it is curious that they aren’t bees I typically see in my garden. I haven’t followed any back into the garden while observing their nest-building because I’ve been too focused (more like too distracted) on checking photos I’ve taken of their work in and on the nests. Not following one of these intrepid bees was probably a missed opportunity. Nonetheless, I’m pleased that native bees of several sorts are plentiful in the garden this spring, busy at their flowering work. 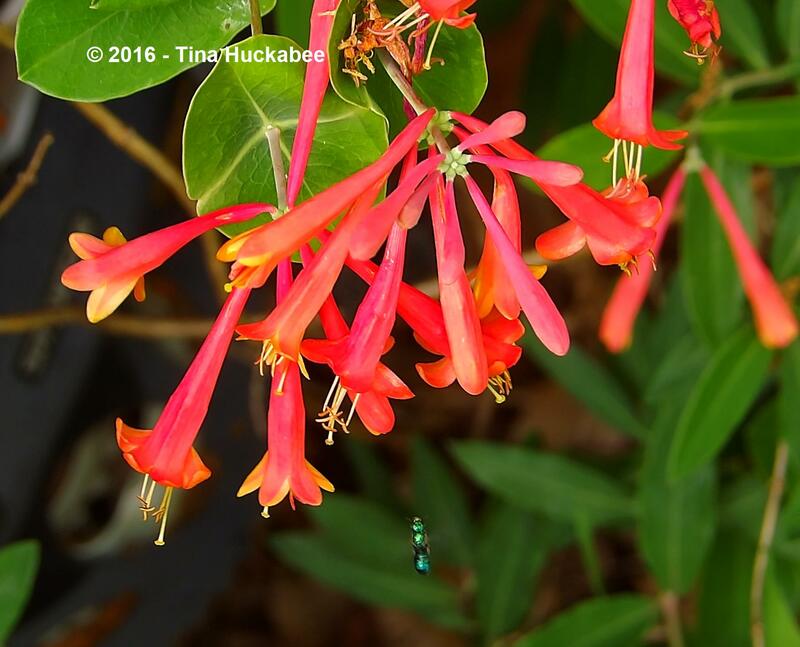 Sweat Bee (Augochloropsis metallica) at a Coral Honeysuckle bloom. Sweat bee flying in for a bloom landing. Horsefly-like Carpenter bee (Xylocopa tabaniformis) at a Coral Honeysuckle bloom cluster. Sweat bee (Lasioglossum spp.) (?) 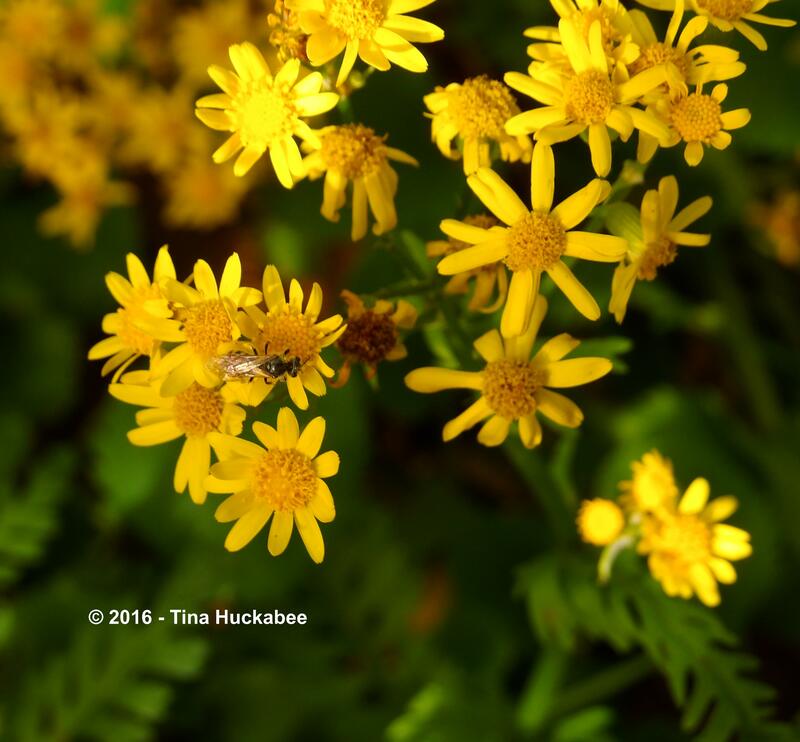 at the blooms of Golden Groundsel. Small carpenter bee (Ceratina spp.)(?) 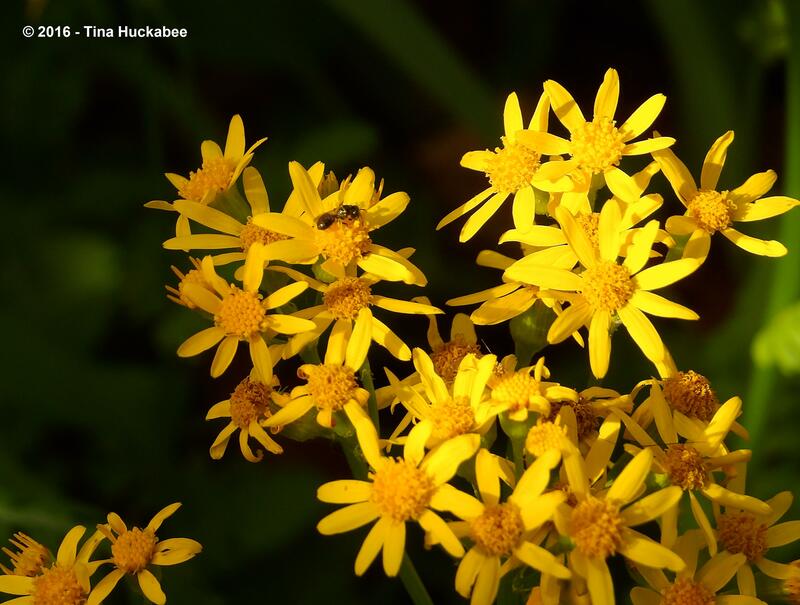 at Golden Groundsel. 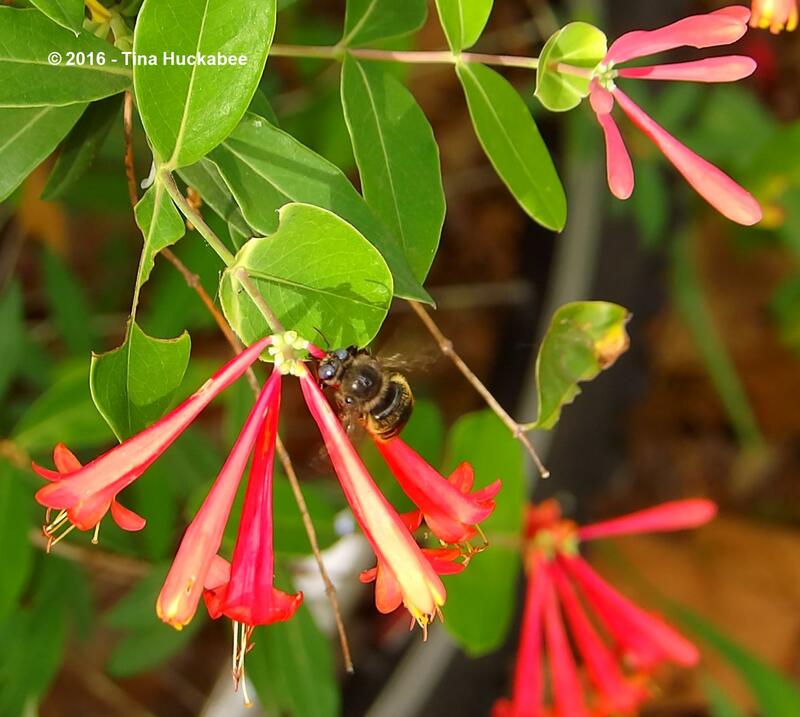 For more information about native bees and how you can make your garden appealing to them, check out this link from the Xerces Society. 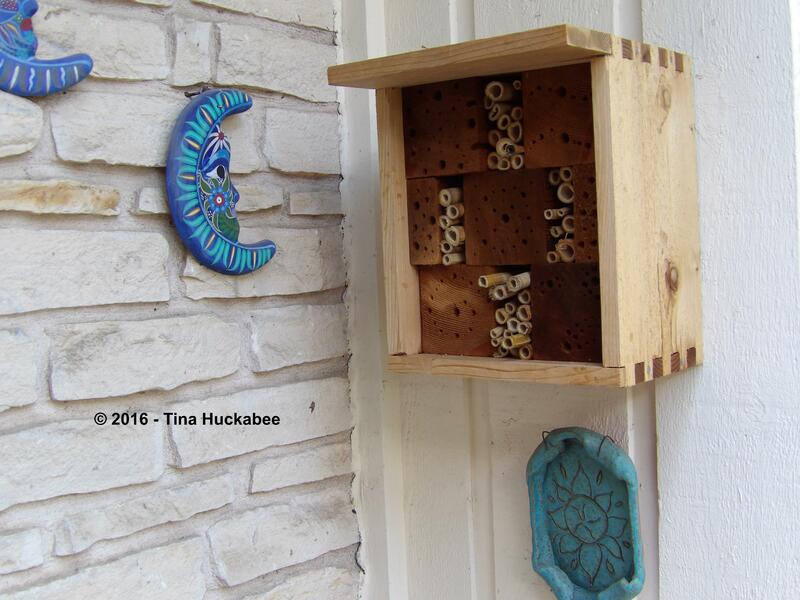 This entry was posted in Bee Hotels, Bee Houses, Native Bees, Texas Native Bees, Uncategorized and tagged Biodiversity, Horsefly-like Carpenter bee (Xylocopa tabaniformis), Small carpenter bee (Ceratina sp. 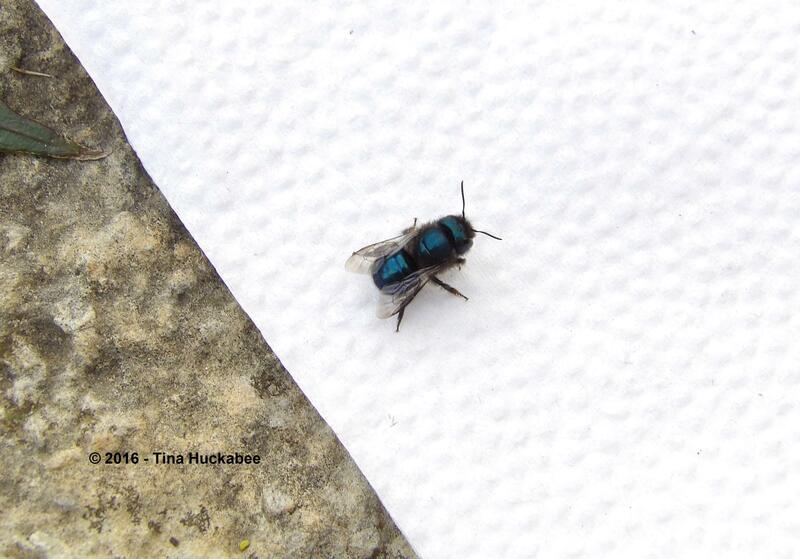 ), Sweat Bee (Augochloropsis metallica), Sweat bee (Lasioglossum ssp. ), Wildlife Gardening by Tina. Bookmark the permalink. Great photos and good information. I don’t think I have ever seen those bees. I wonder if they are in my area or if it is too humid here. I don’t know the names of bees, but I have seen some big bees (checking me out) and wasps. I was also happy to see a couple of Monarchs in my Butterfly Weed. That bee, assuming I’ve identified it correctly, seem fairly widespread in North America (according to BugGuide.net), but like you, I’ve only seen them as they’re nesting. I watched them last spring as well. I wonder if the “big bees” that you’re referring to are the Horsefly-like Carpenter bees. They’re very common in my garden and quite sociable. They chase one another and are always coming up to me and checking me out. Yay for Monarchs in the garden! I’m anxiously awaiting news about the terrible freeze last week as they were beginning the head out for their northern migration. First reports were dire, the later reports maybe not so much–we’ll know soon enough how many froze. Sniff. It seemed worrisome, I was seeing so few bees, and those were mostly working a couple of large lavender plants rather than adjacent native bluebonnet blooms. That initial snub has corrected as the lupine flowers finally developed en masse. Seems it was a numbers game all along. Speaking of numbers, I was similarly concerned there still weren’t very many bees to speak of until the teeny tiny white flowers appeared on this one yaupon that gets the best sun… and boom! Or, rather, buzz! Pollinators galore, bees of every size and all so busy working the flowers they were practically a blur. Ma’am, I bow down in respect to the identifications provided. I was so determined to put the name to every winged visitor here for so long and thought (and here’s a good laugh) I’d since figured out who all the major players were. Cue the regular appearance of a butterfly I do not recognize, and have stubbornly refused to try and look up. You can draw the pollinators into the garden, but you can’t necessarily make the gardener keep trying to figure out which one is which! PS – I join your speculative conclusion…I believe these tiniest bees have been working all our spaces all along but it is not until you look – hard! – and/or start closely checking photos on a screen that awareness grows of how prevalent they are. Yaupons are such great wildlife plants–everyone loves those blooms, that bark, the leaves and let’s not forget the fall/winter berries! As for bee (or anything else, for that matter) identification, I can say with great confidence that there are native bees in my garden, what specifically those native bees are, well that’s another conversation. It’s like trying to id the little skippers in gardens–I’m just not up to that task. Like you, I’ve spent lots of time trying to id, with only a minimum of success, I believe. Still, I press on! 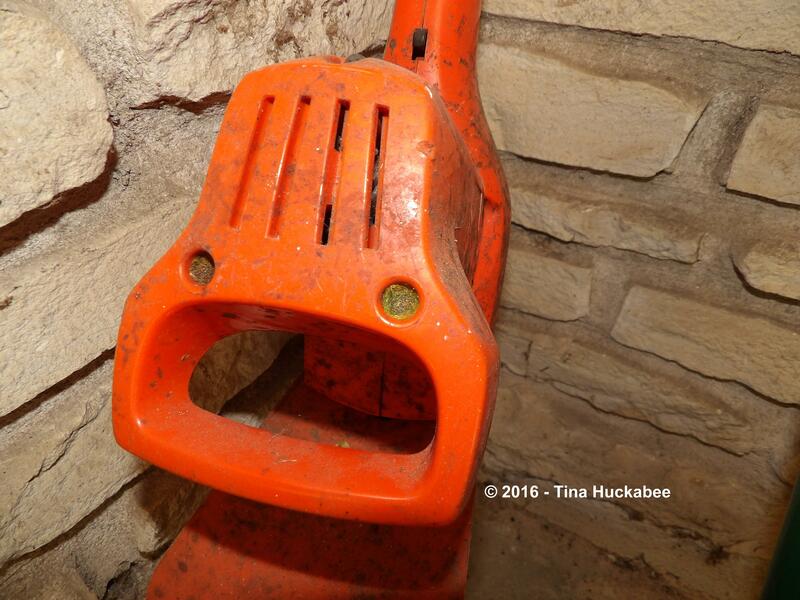 Great post…we have lots of bees and making them a B&B is on my list! Great! They’ll enjoy the new digs and you’ll enjoy watching them! 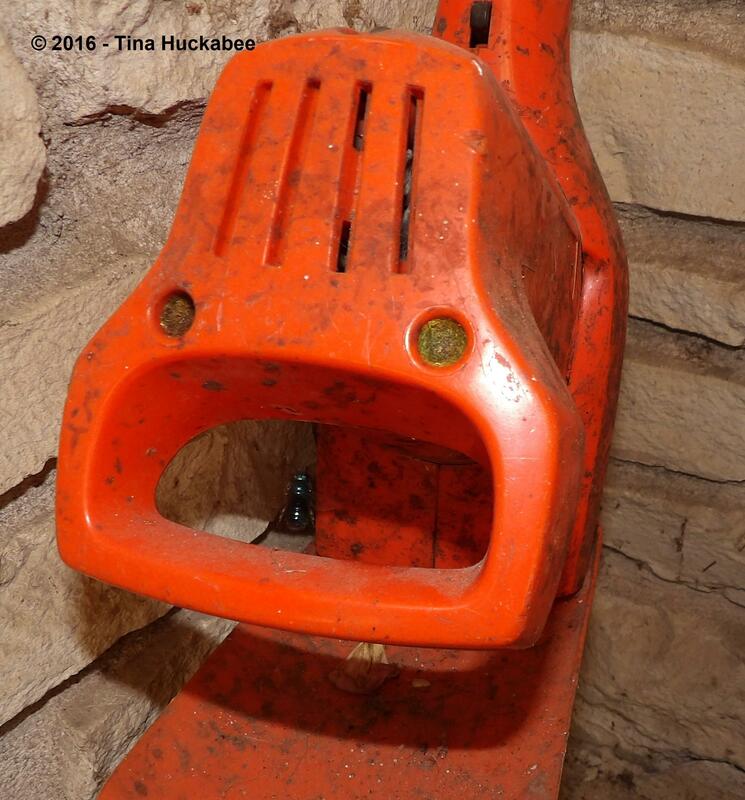 Lovely post Tina, that must be so rewarding to observe your bee hotel and the startling bee visitors. Great link to the bug site too, that looks a really helpful resource. Its still not really warm enough for many bees here, the occasional Bumble and some honey bees about. I have been reading today about flowers opening up early in the UK with milder temperatures but not enough pollinators about to do their thing and pollinate. I hope you get some obliging visitors to your back patio hotel. Thanks, Julie. I’m sure someone will show up!. lt’s tricky, this business of plants opening at times when pollinators aren’t available and visa-versa. I hope your pollinators will hatch and get to it! A fascinating post. I like your shiny black bees, I have never seen them here. We have had bumbles and honey bees enjoying early nectar plants. Thanks, Chloris. I think that bee is so pretty. The photos don’t quite capture the iridescence of the coloring, though. I don’t see many bumbles anymore, though of course, my honeys are busy. I’d never have recognised that first one as a bee. Lovely to see that it and its family/family to… er… bee, look so happy in their new home. it’s not only bees that are opportunistic about where they nest, though, as a few years ago I spotted a wasp going into my amplifier’s headphone socket! It took it a while to realise this wasn’t a good idea then, with some difficulty, it manouevred itself round and out again. I was quite relieved about that! Well, I hope they’re happy, or at the very least, safe. Ha! That’s funny about the wasp. It would have been a bit of a problem if it had laid eggs and then someone clasp the wasp nursery to his or her ear. Ouch! I am so pleased to see your hotel filling up. I have had a small one for a couple of year, but I’ve not seen anything use it. I think I will make one like yours though, with a variety of openings and materials. How nice to see such black, shiny bees about. I wonder if it matters where the insect hotel is placed. Mine didn’t start filling up until I moved it to a protected spot and the other hotel still has no guests, though I just moved it recently. I did read that the hotels should face east and be protected from rainfall. I hope you have guests soon. Brava, Tina. This is such a great post. I have had that experience multiple times now where suddenly I become aware of some kind of life that I never noticed before. Is it new and attracted to some change or an accident of attention and been there all along? As far as I know native bees are connected to seasons — becoming active for a brief moment in time and then seeming to disappear. So for example, the nine spotted enjoys a certain somewhat predictable ‘flight’ period each year. And I just love that word ‘flight’ as a kind of season in their life cycle. That brief moment when they are free. I wonder if the varying rod diameters will attract varying species and if you will enjoy a succession of bees. Thanks so much, Debra. I think that you’re correct in your suggestion that much of observing those in nature is simply about observation. 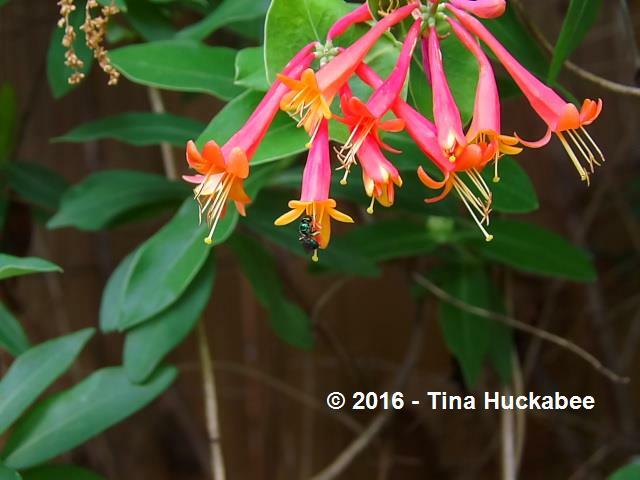 Once I really began to notice native bees, well, they seem to be everywhere in my garden. And I think you’re right about seasonal life spans. 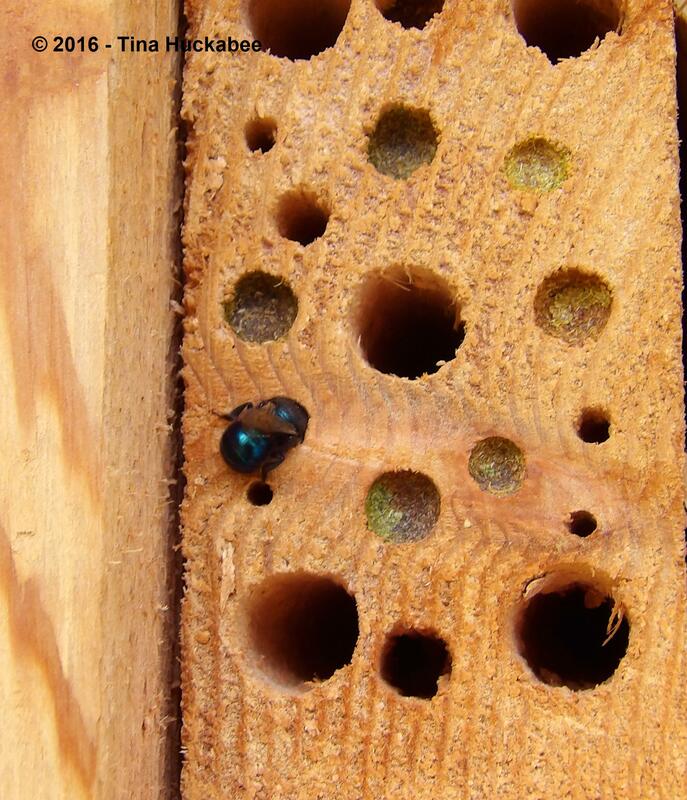 I noticed that Osmia ribifloris last spring at about this time in the holes of the masonry on my back patio and this year, along with favoring the masonry, they’re also building in the bee house, but I mentioned in this post that I haven’t seen them at the blooms. I noticed just today that a visitor to my site pulled up a photo from last year–a Mountain Laurel bloom with one of those bees working the bloom. So, it’s really about my noticing their actions and activities and being aware and learning–they’re here–just doing their thing, whether I see them, or not. Yay, it working! Based on its occupancy, your B&B must be getting good reviews from its guests. What a fun feature to have in the garden. 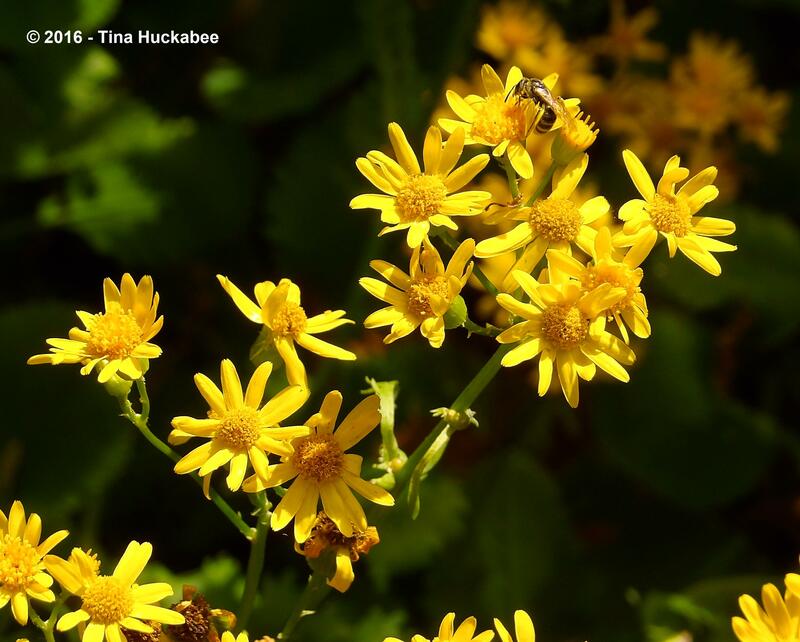 I love your pollinator photos! 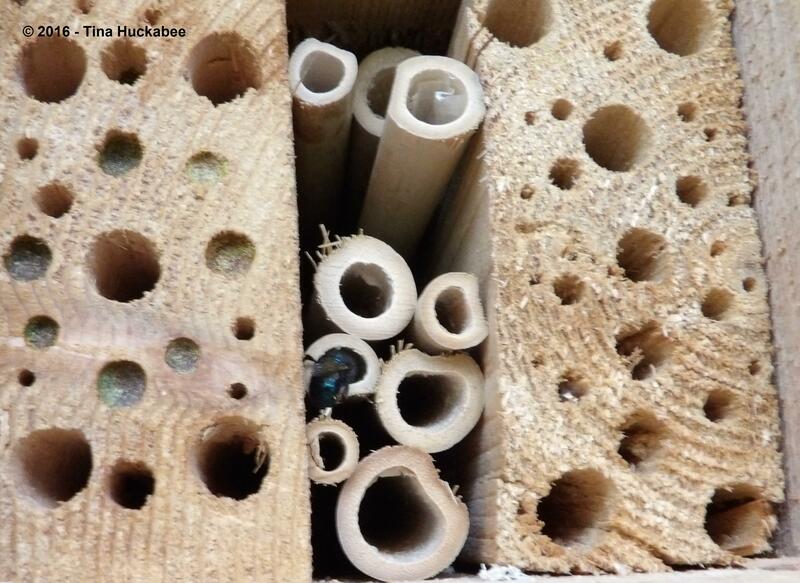 Congratulations on attracting the mason bees to your bee hotel. That’s so fascinating to be able to observe them up close and personal. Thanks for sharing the highlights with us! Thanks, Beth. The bees have been interesting to watch, up close and personal. I have yet to successfully overwinter bee cocoons that I’ve harvested from the previous summer. It’s really frustrating. 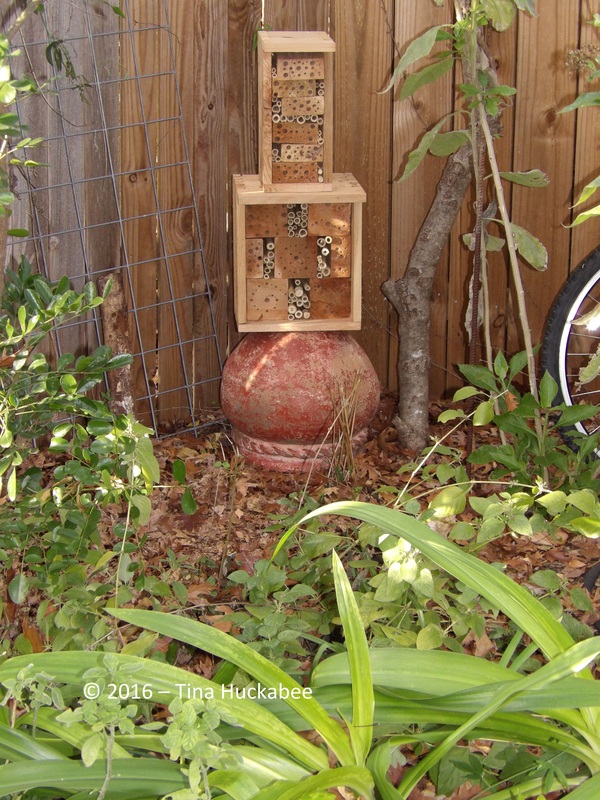 But I have a wonderful bee house and am waiting for a shipment of cocoons and more nesting tubes. Well that is a drag. I’ve never actually “raised” them, I just assume they’re doing their own thing by burrowing in the ground or in wood. Good luck with the cocoons-I hope you’ll write about them during the summer.